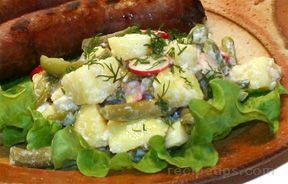 A great salad to accompany grilled tuna or salmon. 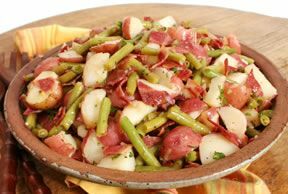 The feta cheese sprinkled on top adds just the right saltiness to this Roasted Potato and Green Bean Salad. 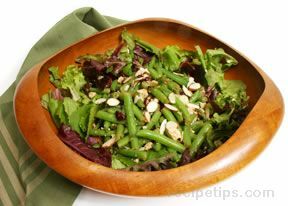 Our Tips and Advice has information that will help you prepare the green beans for this salad. Place potatoes on a baking sheet:; drizzle with 1 tablespoon of olive oil and sprinkle with salt and pepper. Bake for 20-30 minutes, stirring occasionally, or until tender. Place potatoes in a large serving bowl. Over high heat and while potatoes are roasting, bring a pot of salted water to a boil. Add green beans and cook until crisp-tender, approximately 7 minutes. Drain. Add green beans to potatoes in bowl and add mint. Toss. In a small bowl, whisk the olive oil and lemon juice. Add to the potato mixture and toss. Season with salt and pepper. Crumble the feta on top and serve with mint sprig for garnish, if desired.